July 23, 2018 | By Fatima V.
The next day, Courtney and Kolt met with a Maternal-Fetal Medicine specialist who reassured them that they had done nothing wrong and that often there were simply no known causes when a child develops a cleft lip or palate. 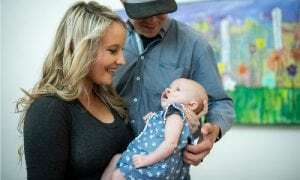 Still, the parents-to-be were left with a number of questions and concerns as they prepared for their first child’s arrival, including how she would eat and breathe, and if people would make fun of her because of her appearance. Though the family lives in East Texas, they decided to deliver Corlee in Dallas to ensure she’d be surrounded by a medical team who could address any issues that may arise during her delivery and early days. On April 8, 2018, Corlee was born, and although her parents had prepared themselves for the worse, she needed no medical interventions at birth. About a week after her birth, Corlee and her family met with a team of experts from the Cleft and Craniofacial team to begin her reconstruction journey to “her perfect smile,” as Courtney puts it. Over the next few months, under the guidance of Yong Jong Park, D.D.S., Craniofacial Orthodontist, Corlee and her family prepared her lips, nose and palate for her first of several upcoming surgeries through a process known as Nasoalveolar Molding (NAM) therapy. During NAM therapy, Corlee wears an orthodontic appliance custom-molded to her gums that gently guides her gums together while helping to reshape her nose and lips. Corlee wears the device for almost 24 hours a day, and her mom Courtney says it has made a tremendous difference. Corlee’s first surgery to repair her cleft lip was July 6, during which Christopher Derderian, M.D., Surgeon, Plastic and Craniofacial Surgery, reconstructed her lip and nose. A few months later, he’ll work to repair her cleft palate as well.